Q: Everyone is talking about making the Modern Infantry Marine more combat effective and to allow greater interoperability; the trick is to do this whilst reducing load carriage, how can you help in this? A: Every user has very different interpretations of what is a “lighter load”. Different forces have different scopes of operations and naturally this means they have (in some cases) wildly different requirements and almost certainly opinions. In the first instance our approach is always to focus on the Human being at the centre of the requirement. Human Factors is a discipline greatly under valued by many (although growing in significance). The hF element of any dismounted solution is the cornerstone of our approach to our designs, materials and capability. In some instances, where the materials or the technology doesn’t exist to meet the design needs, we have worked collaboratively with our supply chain to develop a solution to meet the need. This has ranged from new lighter weight materials developed to save up to 30% weight without compromising on the inherent tensile strength or IR properties of the core fabric, to new technological solutions for power management and distribution. 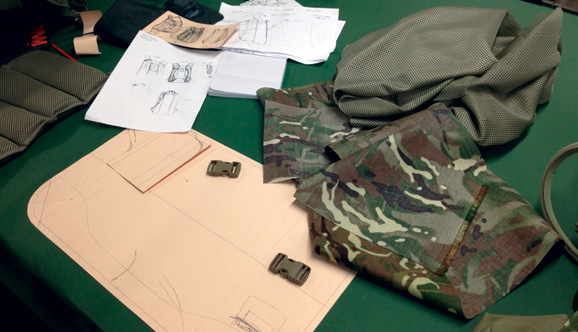 All of these areas, and many in between, have one common goal: to reduce burden and increase ease of use for the wearer, which in turn increases their combat effectiveness. Q: An all encompassing range that can be used in a variety of different environments would really help. Can CQC talk about any specific deployments? A: CQC have developed a range of capabilities to meet all types of environments and terrains. Modularity is the key to any design when building a system from the “man” outward. CQC’s capability has and currently is operating in every terrain and environment on the planet, from the sub-Saharan deserts to the mountains of the arctic circle. Q: Your work with the UK Military and in particular the Osprey system has been effective, where have the greatest benefits and improvements been seen once deployed? A: The Osprey development has provided CQC with a fantastic opportunity to learn and to continually improve the scale of protection, striving to always stay one step ahead of the constantly changing threat. Osprey was a joint development with the UK MOD and it’s not really for us to say what the greatest benefits of the Osprey system have been. Although personally I consider that our soldiers were able to operate effectively, to take the fight to their enemy, to defeat them and to survive in one of the harshest combat environments in living memory is perhaps the greatest benefit of all. Osprey has certainly helped shape the future of dismounted protection systems overall and I suspect in the future when looking back at the history of soldier protection systems, Osprey may well be held up as the ground breaking system that led new technology and capability into the foreground. Q: One of the main areas that CQC have had success is by providing bespoke services, rather than working within a set stable of products; how has that helped you work with forces globally? A: Because we only offer a bespoke service, this has allowed us to work a lot closer with our end users and customer base. By giving them the freedom to work collaboratively and to help design a system that is unique to their own specific needs and operations, the process is far smoother from concept to delivery and the end user is entirely satisfied right from the outset that they are getting something that is not only unique to them, but built to their own specific needs and requirements. This model certainly has its challenges, but our end-users and customers are much more engaged within the process and the relationship becomes far more of a partnership than a simple customer/supplier model. This is further enhanced by our in-country training and advisory team whose sole purpose is to help deliver the systems into service and support the respective end-user with the necessary training to ensure equipment is fielded effectively & quickly. Q: Where do you see the greatest change in Soldier Systems occurring and are we seeing this move fast enough to be properly protecting forces and making them more effective? A: The biggest change in recent years has been toward body armour protection becoming a standard issue, rather than issued only on operations. 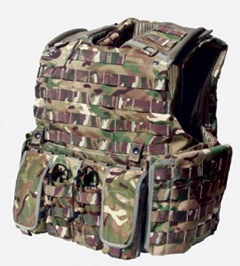 Certainly within many European and NATO soldier Programmes the corner stone of the requirements has been the permanent issue of body armour to their forces. The technology for lighter plates without compromising on protection levels is evolving quickly, but is also still expensive, therefore a lot of focus is being placed on reducing weight wherever else we can. Soldier worn technology is also a significant step change in dismounted capability and the integration of MOTS solutions is beginning to deliver fielded solutions in small quantities. Lighter technology will help to a point, integrated power management systems can rapidly and significantly reduce the burden. Technology is evolving, and it’s true to say that today’s modern dismounted soldier has never been better connected and better protected. The trick now is to take that protection and connection and integrate it further, make it lighter, make it better and make it cheaper.